In December 2015, Chinese President Xi Jinping flew into South Africa for the Forum on China-Africa Co-operation with great fanfare. There were lots of announcements about prospective investments across Africa. Agriculture featured prominently. But what is the real story of China in Africa on the ground, beyond the hype? Read what Ian Scoones has to say. As Deborah Brautigam’s investigative research has so effectively shown, the assumptions about China’s role in Africa are often not borne out in reality. The level of investment and linked aid flows are much lower than the high numbers sometimes touted; the numbers of imported Chinese workers are much lower than often suggested; the areas of land “grabbed” for investment are small compared to the vast areas identified by some. And, as Brautigam’s recent book shows, Africa will not be feeding China or China feeding Africa anytime soon. We set about finding out what was happening on the ground. Working with African, Chinese and European colleagues, our team investigated Chinese engagements in agriculture in four countries – Ethiopia, Ghana, Mozambique and Zimbabwe. All have featured prominently as priorities for Chinese investment and aid. Our just-completed project is reported in a new open access special issue of the journal World Development. So what exactly has been going on? This proved surprisingly difficult to find out. The data on land acquisition, investment flows and aid projects is limited and confusing. It often doesn’t add up. Ghost projects are listed that never happened, and others are missed out. Our original idea of doing a simple geomapping exercise based on available data was quickly abandoned. Instead, we had to triangulate between multiple sources to find out what was happening where. Certainly there is a great deal going on, and the Chinese presence in Africa is important. The Chinese role in agriculture – in terms of business investment, technology transfer, demonstration efforts, training and more – is growing, and shaping perceptions. We chose cases across the four countries to investigate in more detail. The studies aimed to explore the detail of investments, technology projects, training and development encounters more generally. The central question we asked was: is China reshaping African agriculture? The Chinese Agricultural Technology Development Centres are flagship investments. There are now 23 across Africa, funded in their first phase by the Chinese Ministry of Commerce under their aid program. They are run mostly by companies, and are linked to a commercial model for training and technology demonstration and sale. As Xiuli Xu and colleagues show, the centres’ performance very much depends on who is running them. Different provincial companies have very different characteristics, demonstrating that there is no singular “Chinese model” of development, or state-business partnership. We also explored a number of cases of business investments in agriculture, primarily led by Chinese state-owned enterprises. Chinese development efforts mix aid with commerce, linking both provincial and central state involvement with different businesses. For example, as Jing Gu and colleagues explain, in Xai Xai in Mozambique, the Wanbao agricultural development company from Hubei province took over 20,000 hectares on a state farm to farm rice, and develop a contract farming arrangement with surrounding farms. It has not been easy. There have been a number of changes in company leads, disputes with local communities, and shifting alliances with local elites, as Kojo Amanor and Sergio Chichava set out. 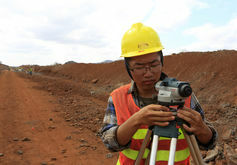 The training of government officials is an important aspect of the Chinese engagement in Africa. More than 10,000 are trained in numerous courses in China each year, many in agriculture. This far exceeds any training initiative of any western aid programme. Henry Tugendhat and Dawit Alemu explored the impacts of these courses, participating in training in China, and interviewing officials who had returned home to Ghana and Zimbabwe. While there have not been many immediate impacts, the longer-term building of relationships and the exertion of “soft power” diplomacy is important. Perhaps the most far-reaching but least understood dimension of Chinese involvement in African agriculture is the growing number of informal migrants getting involved in the agri-food sector, from farming to processing to retail to restaurants. Seth Cook and colleagues investigated this in Ethiopia and Ghana. They discovered a range of activities: relatively few farmers, but growing investment in supplying specialist Chinese foods to burgeoning expatriate Chinese populations. Those involved are very often migrants who came as part of Chinese government contracts, and have since established business connections and stayed, encouraging others to join them from China. Through our work, we were able to gain a snapshot of the early stages of Chinese engagement in African agriculture. Our results show successes as well as failures. But Chinese engagement is certainly not yet at the scale sometimes assumed. In the longer term, activities may accelerate as more opportunities open up. But China is also changing. As its economy restructures to a “new normal”, there are different demands. Food will certainly remain one, but this is not likely to come from Africa. As a new global power, China will want to maintain business, aid and diplomatic relations with Africa, and sustaining relationships will be important. China plays the long game, and our studies were observing just the opening stages. This blog previously appeared in The Conversation.